Dandelions bring back some romantic childhood memories! Imagine yourself playing outside in a field, on a beautiful sunny day…and picture a sea of field flowers: daisies, or perhaps dandelions?…..and how you used to make dandelion wishes hoping they would come true! Long time ago our grandmothers knew that dandelion greens, flowers or roots contain many medicinal substances – however, what they certainly didn’t know at the time is that dandelion root may help prevent or reduce allergy, kidney and cancerproblems! Speaking of dandelions, even modern age scientists claim that dandelions are extremely powerful medicine. How exactly? We’ll find out soon enough! But let us firstly discover some spiritual dandelion meaning – interestingly enough, all flowers have meanings, dandelions too! Dandelion or Taraxacum officinale has a very interesting history, meaning and symbolism. In Medieval times it was called Lion’s teeth for its teeth-shaped leaves. Dandelion name derives from a French phrase “dent-de-lion”which was developed within Middle English as Dandelion. Symbolism behind the dandelion meaning is connected to having spiritual strength, surviving difficult times, being positive and hopeful for your future wishes and dreams. Obviously, dandelion is a valuable plant that is traditionally known for its medicinal but also spiritual properties. 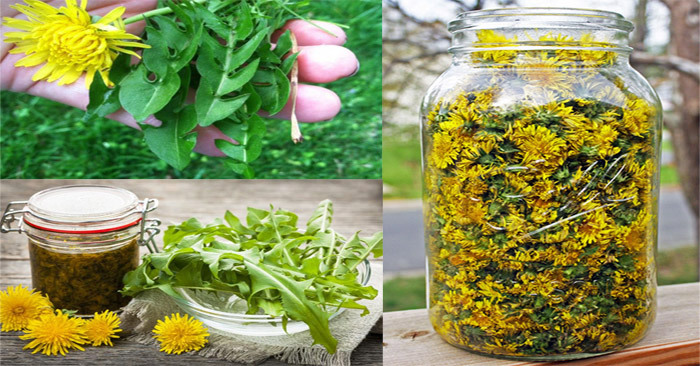 Going back to dandelion medicinal properties – dandelion cures cancer, hepatitis, liver, kidneys, and stomach! At least, this is what the headlines say! So let’s share some of the dandelion benefits. In addition to its diuretic properties, dandelion stimulates the secretion of bile, cleanses your liver, helps with allergies and reduces cholesterol. It is even recommended as a dietary supplement for pregnancy and postmenopausal period. It contains very important vitamins and minerals such as vitamin B6, vitamin C, iron, magnesium, folic acid, calcium, thiamin, riboflavin, and potassium. Can you imagine – dandelion has more carotene than carrots!!! !To illustrate this, dandelion contains up to 110% of the recommended daily intake of vitamin A and a number of antioxidants (polyphenols). These simple dandelion facts are known for years. However, recent studies have shed new light on the dandelion benefits. The University of Windsor in Canada conducted an initial research regarding dandelion benefits. The dandelion research results seem to provide new hope to cancer patients. The research shows that the dandelion root effectively eradicates cancer-affected cells without any harmful effects onto other healthy cells. A 72 -year-old man used dandelion to cure himself of cancer. And he did it! Prior to using dandelion, he underwent intensive chemotherapy treatments in his fight against cancer. After the doctors told him there were no suitable medical solutions, the man started to consume dandelion root tea. According to the Natural News website, this man was disease-free only after 4 months! Several other health and nutrition websites confirm the claim that dandelion tea can potentially disintegrate harmful cells within 48 hours, during which time no new healthy cells in the body are attacked or damaged! Dandelion contains many bitter substances. Dandelion bitter substances put your digestive system and your liver to work – that’s good, because your body can be detoxified! Your liver makes bile, which improves the digestion of fat. Bitter herbs such as dandelion thus stimulate your liver, causing proper digestion. Dandelion also stimulates your kidneys to dispose unnecessary bodily fluids. Dandelion is also interesting for its antihistamine properties. In other words, it is allergy repellant! And this is where the confusion hits in for me – aren’t plants giving us allergies in the first place?! Those among us with allergies and eczema know exactly what I am talking about – runny nose, itchy and watery eyes or irritated skin! Can you imagine that dandelion can help you with your allergies?! Strangely enough it can! What is more, not only does it help proper liver function but it also lowers histamine levels in your body. Additionally, dandelion has anti-inflammatory function, which of course calms down your hay fever symptoms. You can use dandelion in many ways. For example, you can use dandelion roots, dandelion stems, dandelion flowers, dandelion leaves or make dandelion root tea, tinctures or salads. Dandelion roots are the winter stock of the plant. The roots are said to cure cancer or kidney related issues. Dandelion stems enhance the gall bladder dissolution, regulate metabolism and purify your blood and stomach. Folk medicine recommends stems against diabetes. Dandelion “milk” is known for wart removal. Although some believe that the dandelion ” milk ” is toxic, others say the opposite is true. Dandelion flowers can produce dandelion honey, tea or syrup. The dandelion syrup cleans and strengthens your blood and improves digestion. Dandelion syrup (or “honey”) also helps against coughing. Dandelion leaves are used in salads. Dandelion greens combine well with boiled eggs or potatoes. Dandelion greens contain the most nutrients in early spring, before flowering! After that, all the energy goes into dandelion flowers. As shown below, dandelion offers a variety of recipes for preparation, from dandelion honey or syrup, to dandelion tea or salads. Pick 400-500 dandelion flowers; clean and wash dandelion flowers and put into a glass bowl.Pour 3 liters of cold water over your flowers; place the slices of lemon and chopped oranges. Leave all the ingredients rest for 24 hours.Next day strain through a colander.Put the liquid into a cooking pot.Add 2 pounds of sugar and cook for 1-2,5 hours (while stirring frequently). This home-made dandelion honey is a perfect cure for your family against colds, coughs or bronchitis. For consumption, use a wooden or a plastic spoon (as with any type of honey, metal spoons are not recommended). Put your potatoes, chopped dandelion greens and green onions into a glass bowl.Add your lemon juice and mayo to the ingredients and mix.Add your finely chopped boiled eggs, curry powder and salt and pepper to own taste Serve your dandelion salad with some chicken or turkey sandwiches. If you want to dry your dandelion roots, you should firstly peel and cut them into equal, smaller pieces. Air-dry the dandelion roots in a cool dry place with good air flow. Dandelions roots should be dry after 14 days. When you are sure that the dandelion roots are dry, finely chop and mince them into dandelion powder. Store the powder for future use in glass jars, in a dark and dry place. If needed, drink half a teaspoon daily with a glass of water. Is the dandelion herb more effective than chemotherapy against allergies, kidney or cancer issues? Whether you believe the dandelion claims or not, one thing is sure – traditional medicine can’t have all the solutions so we sometimes need to trust nature for its immense healing powers. It is always worth a try! Feeling inspired or encouraged? Then it is the right time to step into the nature and get your dandelions!